Putah Creek rainbow trout are unique in that they spawn during the winter and not during the spring like most rainbow trout. 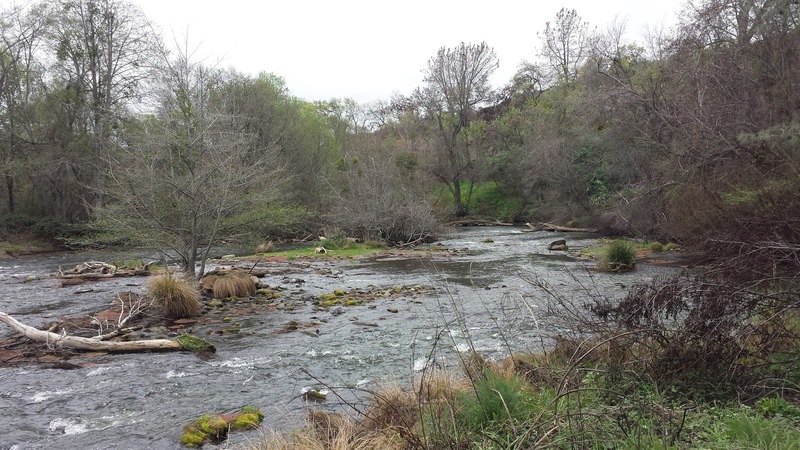 Although Putah Creek is legally open year around, there is an unwritten rule to avoid fishing the creek from late November to February while the fish are spawning. Putah Creek has very limited spawning habitat and with bare minimum flows during the winter, these rainbows need all the help they can get in order to survive the spawning process. Now that the winter spawn is over, I planned a trip for Putah Creek. The primary fly fishing technique used on Putah Creek is nymphing. Throughout my visits to the creek I've tried nymph fishing but have always felt that I was missing something. Light tippet in 4x to 6x and tiny flies are the norm on Putah Creek, therefore when you hook into a nice fish you need all the leverage you can get. My theory about why I was failing at nymphing was that my fast action rod just didn't have enough flex to protect my tippet. Finding and hooking fish wasn't an issue, it was playing and landing them. 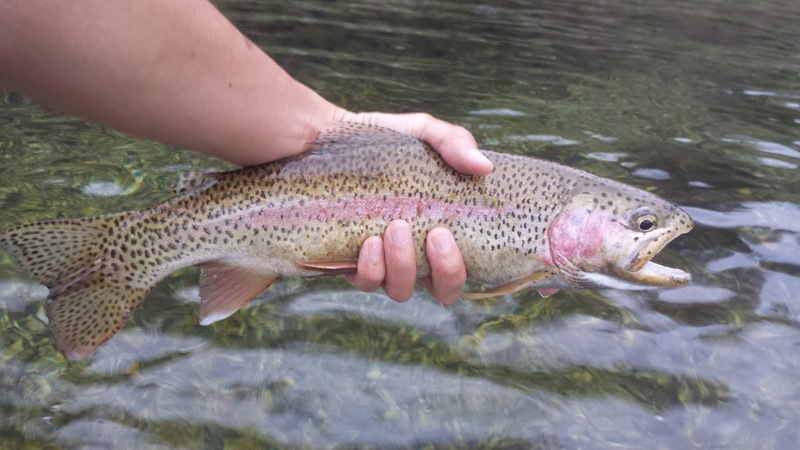 Putah Creek rainbows fight very differently from any other rainbows that I've hooked and landed. Here is a list of what I've found. Takes are often very subtle. Putah bows almost "float" when hooked. This seems to help them to throw the hook when they immediately headshake after floating for a few seconds. 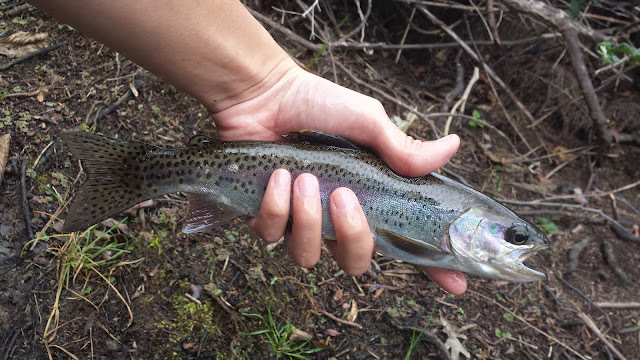 Once hooked these trout will run towards cover to try and break you off. Since Putah Creek is full of debris they are often successful. The smaller bows get jumpy. Now that I have a new medium-action 5WT with a softer flex, I was finally ready to find some success nymphing the creek. The creek is very low at 122 CFS. 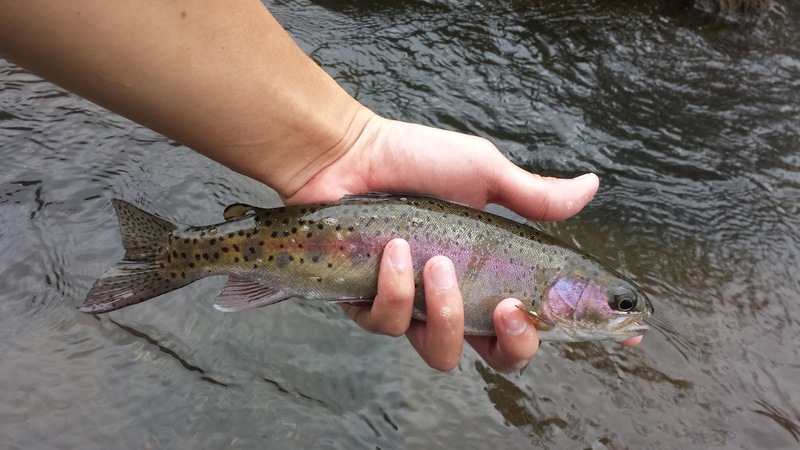 It is very easy to get around the creek at these flows but there are also less fishy spots to try your luck at. The water was warmer than I expected probably around the upper 50°F. With warmer water and a great overcast, caddis and mayflies were coming off like crazy in the afternoon. Tight-lining is perfect at these flows and that's what I did. Throughout the day I managed seven hook-ups with four landed. I threw streamers for a bit and got one good whack from a 20 incher but no hook-up. I missed two 20 inchers this visit which was quite the bummer but the four fish I landed were absolutely beautiful. The softer flex helped a lot with fighting the fish. Success! A few days later I made the mistake of misreading the flows before heading out and noticed the flows were way higher than what I had expected. The flows were cranked to 1700 CFS on March 3rd which is uncomfortably high for wading. I had planned on throwing streamers but at these flows it's pretty much pointless. I left after an hour. Since this is an El Nino year, March is usually the one of the wetter months of the year. I am predicting lots of blow outs and muddy water... more fun for me! I've been enjoying your blog Matt. I was up at the Lower Yuba last week and got 1 rise on a dry and didn't see another fish all day. So, is the spawn at Putah considered over now? How does the rain affect flows at Putah (as we're about to get blasted again starting tomorrow.)? I've never been to Putah. Got any advice for a first-timer there? Thanks Earl, I'm glad you are enjoying reading my blog! Rising a one fish on the Yuba is equivalent of rising 10 fish from any other stream. There's something special about getting those Yuba fish to come up. The Putah Creek spawn is definitely over. During the last storm the flows were raised to 700 CFS below Berryessa and really muddied the creek up. In addition to the quick-release of flows, the runoff from last year's fire also adds ash, charcoal, and a bunch of other nasty stuff to the mix. Like most of our rivers in Cali, it’s going to be a while before it's fishable. I haven't been fishing Putah Creek for very long, last year was the first year I really hit it. 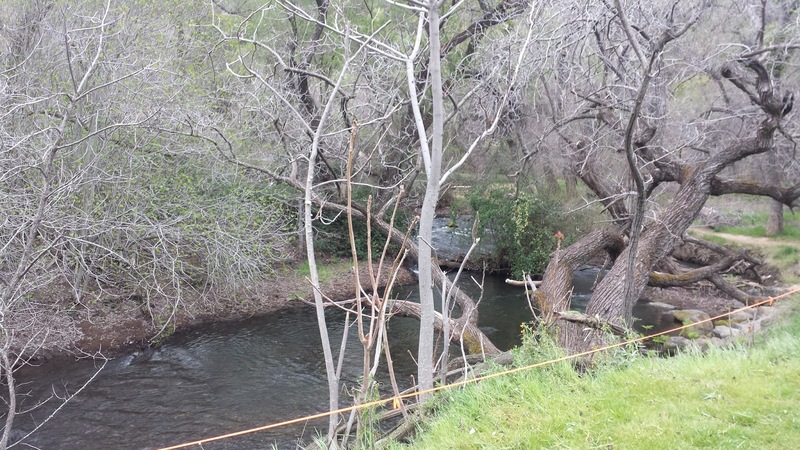 This little creek is such an amazing fishery and if you read some of my previous posts about Putah Creek you’ll understand why. 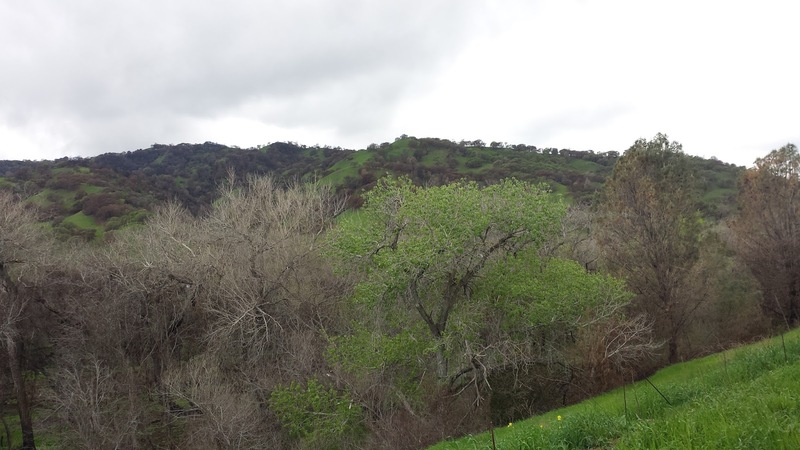 I’m still quite new to Putah Creek but I know you will find some usefulness in my perspective. Here are my tips. 1.Only use roll-casts. There are very few places where you will be able to backcast. 2.Use small flies. The naturals there are pretty small. Your favorite bwo, caddis, and midge patterns in #18 - #20 are your best bet. I only use two flies at a time there because of all the debris on the bottom. 3.Don’t use 6x – 7x tippet. My preference is 4x and 5x because if you hook into a 20’’+ fish you’ll have a significantly better chance of landing it. 4.Use a rod with a soft-flex/medium action. These bows are weird fighters and to adapt to their fight you’ll need a rod with a good bend. 5.Explore and cover water! Putah Creek has limited access and can get crowded really fast. You need to cover water and think outside the box in order to get these fish to eat. Thank you for the info Matt. The video was helpful. I spent the aforementioned morning indicator nymphing on Yuba, so I kind of understand the process. I'll keep checking the reports and weather and maybe I can get up on a weekday and try to avoid the crowd. Keep up the good work on the blog!